This blog was written by first year English student, Sasha Gardner. 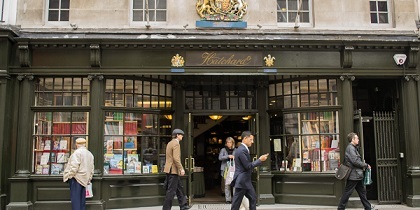 Established in 1797, Hatchards in Piccadilly is the oldest bookshop in London. 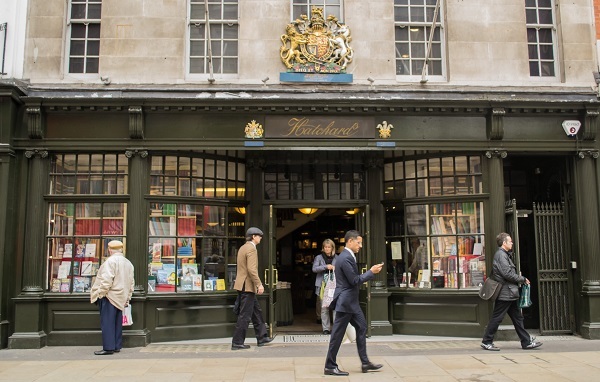 With customers ranging from Oscar Wilde to Bill Nighy, Hatchards holds three royal warrants and is, undoubtedly, the fanciest bookshop around. For three years, I have been lucky enough to work as a Hatchards bookseller during the holidays, a role which has proved vastly more varied, fast-paced and enjoyable than I could have hoped. Friends and family seem to think that working in a bookshop entails reading for much of the day – sadly, this is not the case. The majority of the working day is taken up by shelving, recovery (tidying displays and shelves) and customer service, and any spare time is filled by countless unseen tasks behind the scenes. In fact, this is just what makes the job so fulfilling – each bookseller has a sense of purpose and we are all working together towards a common goal; not just reaching daily sales targets but sending books out to as many loving homes as possible. Booksellers are expected to keep up with the latest publications as far as possible, and this (along with a generous 50% employee discount) provides a convenient excuse to acquire many more books than is generally advisable. And reading the latest novels, not something I would otherwise do, has proved enormously rewarding and important in the development of my reading tastes; who knew how thrilling Zinovieff, Honeyman and Alderman could be? The satisfaction when I finally find just the book I was looking for, when a customer buys a personal favourite book of mine, or even when a book fits just perfectly into a shelf; these small pleasures are what make the bookselling industry as wonderful as it is, and one in which I am proud and grateful to work.